Love your site! Thanks for the offer. Ahh spending Saturday night with TT. thanks for the great giveaway chance. 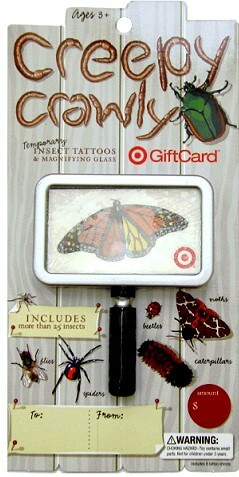 Love Totally Target and love insect tatoos! I already have liked Totally Target on facebook! What a fun gift card! Thanks! This gift card would go a long way with Target’s awesome clearance finds! Love this site. It’s so helpful! Thanks for the chance to win! That’s awesome to have in the purse for the kids! I would love to win this target gift card! Creepy, Crawly, Insects… what a fun gift card and thanks for the chance to win! I already like Totally Target on Facebook! Yeah! love your site, look forward to sunday morning to get your updates! pick me pick me pick me pick me pick me pick me pick me pick me pick me pick me pick me pick me pick me pick me pick me pick me pick me pick me pick me pick me pick me pick me pick me pick me pick me pick me pick me pick me pick me pick me pick me pick me pick me pick me pick me pick me pick me pick me—-THANKS! I love target and I love your website for showing me how to save money at target! I already like you on Facebook and look forward to all the great deals and matchups! I LOVE Target! Thank you! I already liked you on FB!!! Crossing fingers now! !